This book landed in the Donations at the library and made its way to my desk. 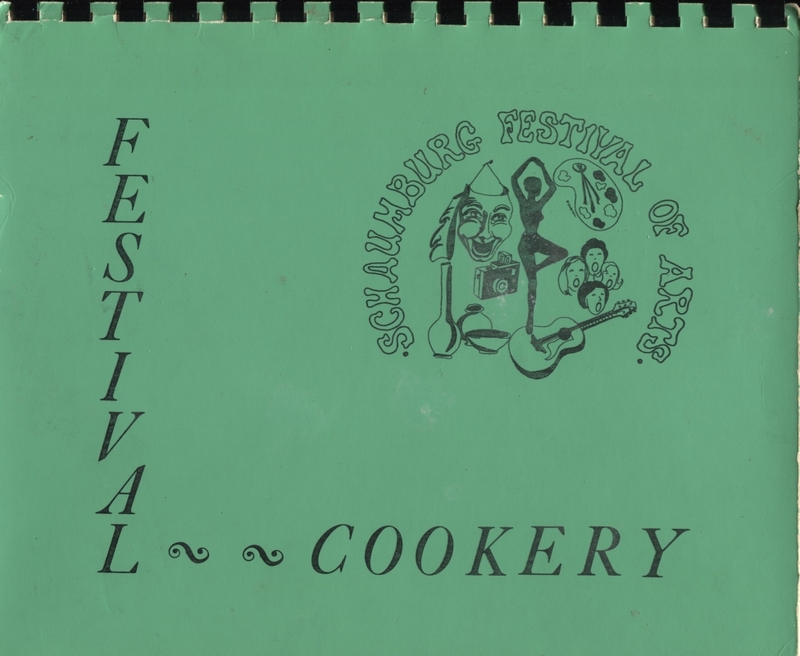 In addition to browsing the book and the recipes, I was intrigued with the organization on the cover–Schaumburg Festival of Arts. That was new to me. 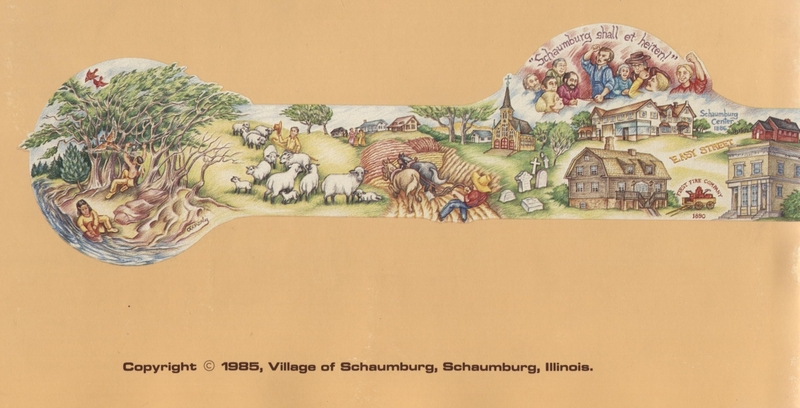 In doing a bit of research, I discovered that the Schaumburg Festival of Arts was organized in 1970 with two main objectives. The first objective was to find ways that allowed both Schaumburg and area residents to express themselves artistically. The second was to finance a Schaumburg Civic Center that would serve as a location for various cultural events and entertainment. 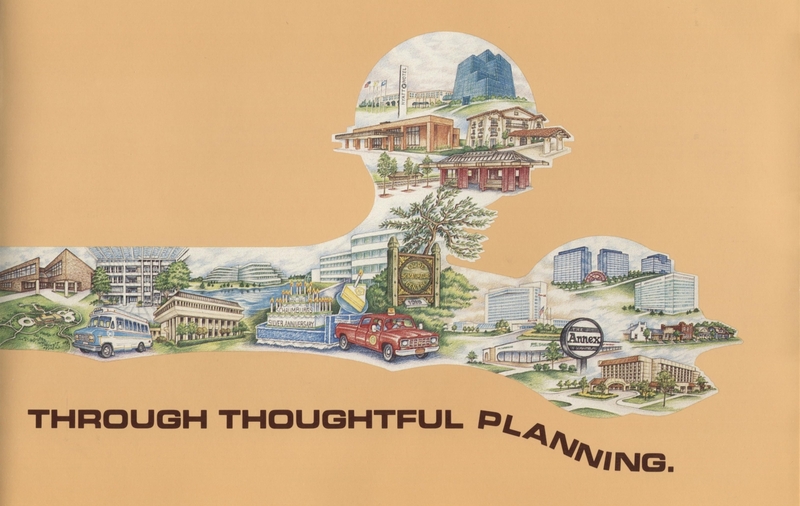 In early January 1971, it was announced by Chairman Sonja Leraas and Honorary Chairman Mayor Robert Atcher, that a grand festival would be held on the weekend of June 19 & 20. Most events would be held at Schaumburg High School. Artistic creations would be on exhibit in the parking lot for both days with some available for sale and others available for show. The works would include paintings, water colors, ceramics, sculptures and crewel work. Michael Madden, director of the Schaumburg Township Public Library, served as exhibition committee chairman. A magic show would be presented by Joe Vyleta of Mount Prospect and billed as Young People’s Theater production and held in the school cafeteria. Paul Derda served as the committee chairman. Talent ’71, a talent contest for persons aged 14 to 19 was also held in the cafeteria. Winners would receive prizes. Also on Saturday evening, three, one-act plays would be shown in the cafeteria. The following day, music from 1961-1971, A Swinging Decade, would be featured and dancing would definitely be encouraged. A poetry contest would be held in local elementary schools with the winning poem being printed on the back of the festival’s program. Winning poems from each school would be given a free ticket to all events with the grand prize winner also receiving $10. A poster contest for junior high students would be used to promote the event in local, cooperating stores. Winners would also receive free tickets to the events. An “Evening of Plays” was also scheduled. Raoul Johnson, an assistant professor at Loyola University and the director of the plays, eventually chose two plays to be performed. The first was “The Brick and the Rose” written by Lewis John Carlino. Ten actors portraying 46 characters would sit on stools using only their voices and facial expressions to act their parts. The other play was “Next” written by Terrence McNally and featured only two actors. Some events were free and others, like the dance and “Evening of Plays,” charged a fee. At the end of the weekend, nearly $1000 in profit was accumulated. Unfortunately, most of the money raised came from the food sold at the refreshment stand–and the funds raised from the cookbook you see featured here. “Evening of Plays” proved to be the most well-attended event and word-of-mouth spread so fast that the second night sold more tickets than anticipated. The actors received a 3-minute standing ovation on Sunday night. Response was so good that they put on an encore performance the following month at the newly formed Schaumburg Festival Theater. Unfortunately, the Festival Theater and the Festival of Arts were in existence for only one year. While the desire was there, the attendance was too low to continue. 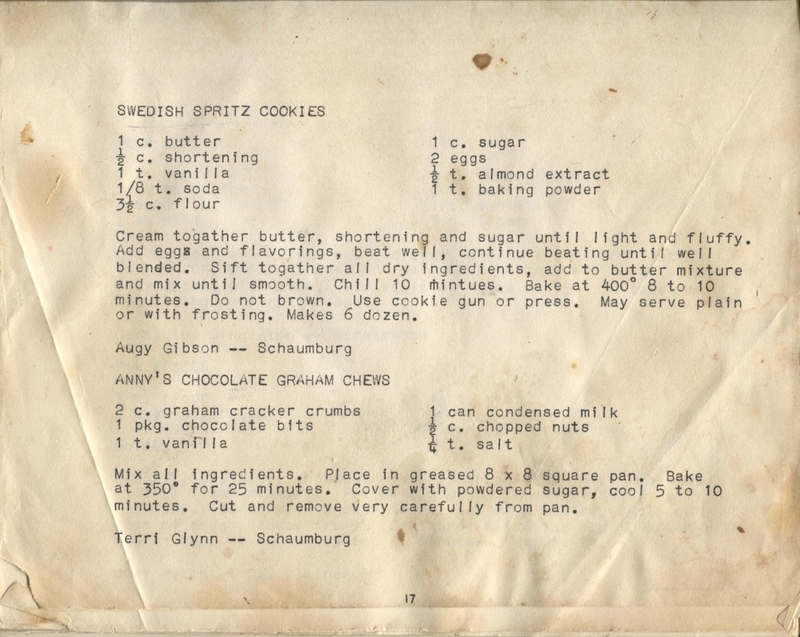 Someone, though, liked the cookbook and, in particular, either the Swedish Spritz Cookies or Anny’s Chocolate Graham Chews. Given the fact that this organization lasted for only a short period of time, it is fortunate that over 40 years later the library was the recipient of a small part of their agenda. Articles from The Herald were used to put this blog posting together. Dates used from 1971 were January 19, April 19, June 24, July 16 and December 17. 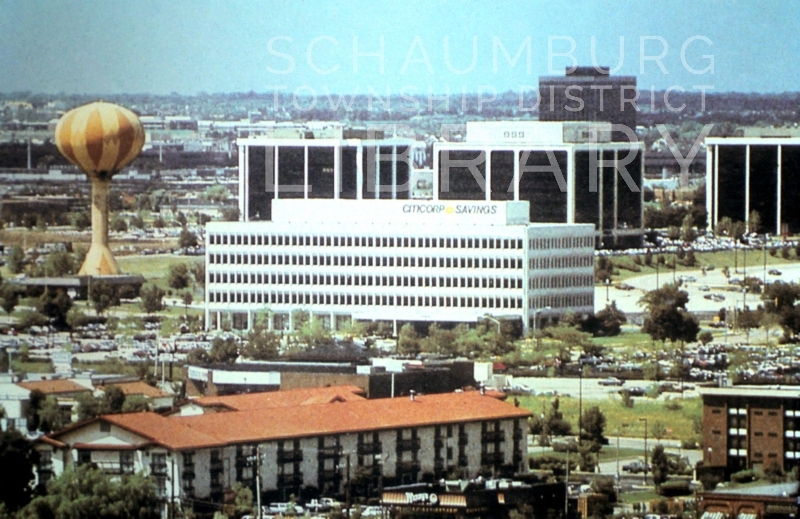 Happy Birthday Schaumburg! You turned 60 this year on March 7, 2016 and we’re happy to celebrate with you! In honor of your birthday year, we’re doing a monthly blog posting based on some of our favorite things about you. 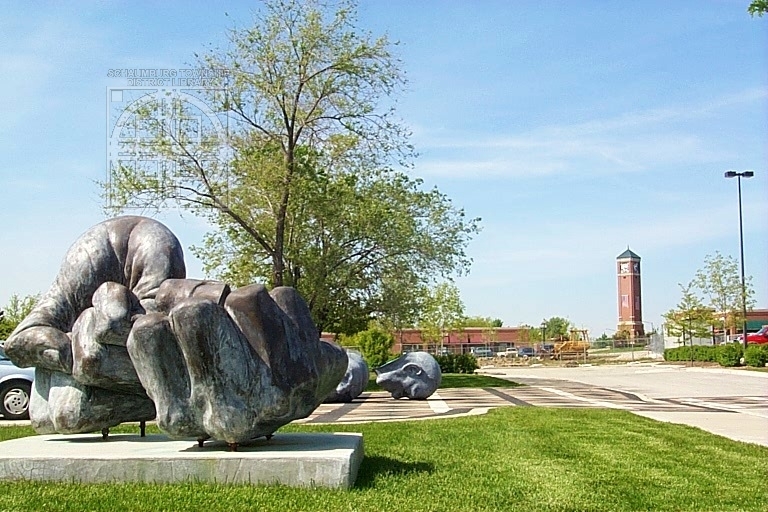 During the month of April we’re asking the readers of this blog to share their favorite piece of public art that has appeared in Schaumburg. Maybe it’s one of the pieces in the sculpture garden near the village hall? Or, maybe you liked one of the big chrome pieces that was in Center Court at Woodfield? How about the big Weber grill at the restaurant by the same name? 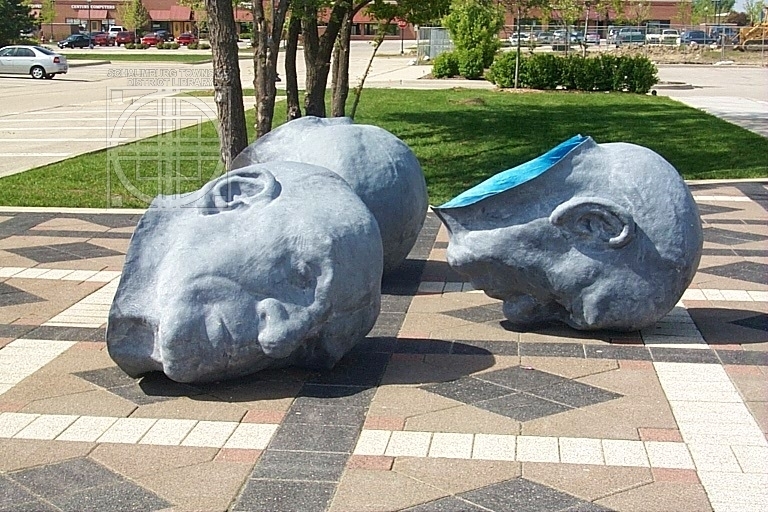 Possibly it was one of the heads that appeared outside of the Chicago Athenaeum on Roselle Road? 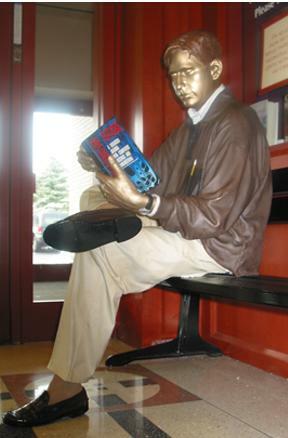 Or maybe it’s this much loved gentleman that you can find in the foyer of the library. Maybe you remember one from the past that has slipped into obscurity or there was one in the school you attended day in and day out. Whatever the case may be, please share with us!